Taipei, Taiwan, January 2019 – Advantech, a leading provider of industrial computing hardware/software solutions, is pleased to announce its CNC Machine Management solution-ready package (M2I/CNC SRP) with visual OEE and cross-factory CNC management for IoT cloud services. 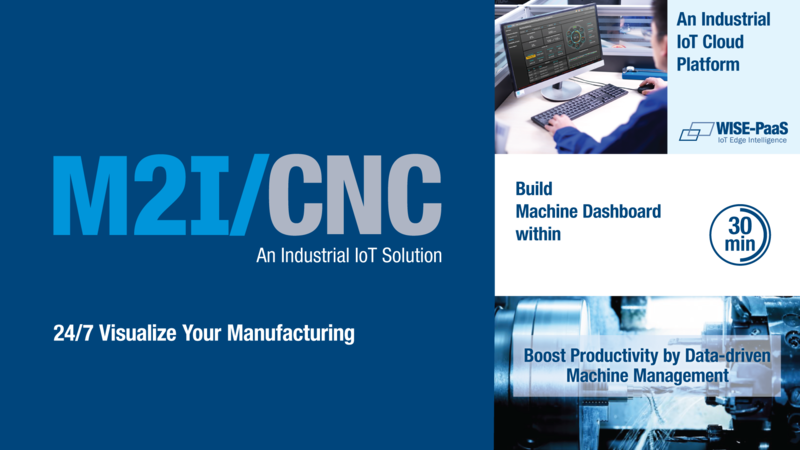 The solution includes a CNC edge Advantech, a leading provider of industrial computing hardware/software solutions, is pleased to announce its CNC Machine Management solution-ready package (M2I/CNC SRP) with visual OEE and cross-factory CNC management for IoT cloud services. equipped with an Intel® Celeron® J1900 processor, 4 GB DDR3L RAM, 64 GB SSD, Windows 10 operating system, and WebAccess/CNC Runtime software. The ruggedized, fanless design allows users to run the IoT edge in harsh industrial environments. Pre-installed WebAccess/CNC Runtime software enables direct connectivity with CNC controllers and facilitates machine data acquisition on the WISE-PaaS industrial cloud platform. By subscribing to M2I/CNC Cloud Service on Advantech’s WISE-PaaS Marketplace, users can easily examine the OEE, performance, and alarm history of each CNC via Web-based dashboards. Advantech’s CNC solution is transforming traditional machine management by enabling cloud-based centralized machine management and providing the tools to stay ahead of the IoT trend. Real-Time Machine Monitoring Advantech’s machine monitoring services are built on its WISE-PaaS industrial cloud platform. The cloud platform allows users to easily collect data from multiple sites and conduct centralized data management. The cloud system also supports data redundancy for enhanced reliability. [PW1] [PW1]The original was nonsensical and confusing. Please check my revision to ensure accuracy. Dashboard-based visualization of OEE indicators combined with historical performance data and real-time trends provides a clear operational overview and insights for improving maintenance. Moreover, with the inclusion of pre-built cloud services and tools, such as a configuration portal and CNC dashboard template, Advantech’s M2I/CNC SRP is convenient and easy to implement. The provision of downtime duration data, alarm events summary, and alarm analysis functions helps users to identify key issues and take action to minimize system downtime, resolve abnormalities, and optimize operations. Advantech’s M2I/CNC generic cloud service eliminates server room maintenance and facilitates centralized data management by supporting instant machine-to-cloud data transmissions. Advantech’s M2I/CNC SRP for intelligent CNC management is available for order now. For more information regarding this or other Advantech solutions, visit the Advantech website.